When thinking of a stampede, it's natural to envision the running of bulls. 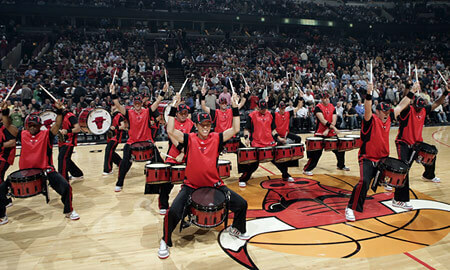 And living up to that namesake, "The Stampede" is a group of 15 explosive drummers who are a new feature of the NBA's Chicago Bulls home basketball games. The line is unique in that it performs to recorded music known by the audience, while adding its own flavor and stunning choreography. The performances during game breaks are laden with stick tricks intended to make the audience gasp as those watching interact with the high-energy pop music. Aged 22 to 47, Stampede members have marched as members of the Bluecoats, Blue Stars, the Cavaliers, Madison Scouts, Phantom Regiment, Pioneer and Star of Indiana, in addition to university drum lines. The group is directed by Scott Idle, a former marching member of the Cavaliers and Michigan State University drum lines. Of the group's 17 members, 14 also perform as part of the Chicago Bears Drum Corps, a drum line group presented by the Cavaliers for the NFL. Idle went to the Bulls with the idea of the line just a year ago, convincing the team that the success of the Bears line would translate to indoor success as well. Check out this video clip of the Stampede in action. According to member Adam Hill, most of the Stampede's members have gained their skills from marching as members of drum corps. "The ensemble strives to attain the same level of excellence as witnessed in top drum corps drum lines, a level of commitment that is returned by the enthusiastic response of the fans," he said. Idle admits it's a challenge to stay appealing to the crowds while maintaining the members' needs to excel at drumming, admitting, "The crowd generally doesn't care about hybrid rudiments, metric modulations and clarity/cleanliness. 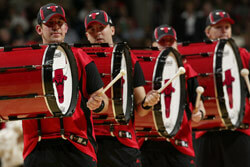 They prefer drum-to-drum flashy tricks and choreography." To get the crowd more involved in their performances, the line visits the upper balcony and concourse levels of the United Center to initiate cheers and to make fans feel like they're part of the action. But it's the on-floor performances that really get the attention of the audience, loaded with stick routines and daring tight choreography. Back on the floor, they interact with the IncrediBulls Cheerleaders to get the crowd riled up throughout games. Idle mentions that the Stampede is not the only such professional sports drum line in existence, adding, "If you happen to see any sort of instrumental musical act at any game of any league or sport and you enjoy them, write an e-mail to that organization's marketing department to let them know how much you loved them and explain the impact they had on your experience. It's important that we support each other and the endeavors we all pursue."